Many of the volunteers who make Natural Parents Network fabulous met in two different locations last week for our first ever get together. 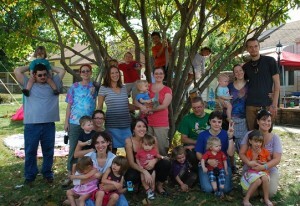 Thirteen volunteers and their families met at Dionna’s house in Kansas City, and eight volunteers and their families met in Seattle at Moorea’s house. On Sunday evening, we also connected via video chat with several more volunteers who were with us in spirit, but could not drive or fly to one of the two locations. Today many of the volunteers are posting about the get togethers on their own sites – you can find links at the end of this post. We also wanted to thank some of the companies who generously donated product samples or offered coupon codes to our volunteers – we were able to create some fun “welcome bags” for the Midwest volunteers with the samples, since they came in for the whole weekend. The coupon codes are good for all NPN volunteers! Thank you for making our gatherings special and for supporting our community of volunteers! Dionna at Code Name: Mama writes Wanted: More NPN Volunteers in Kansas City! Also find Dionna on Twitter and Facebook! Jorje at Momma Jorje writes Vacation Weekend with Volunteers. Also find Jorje on Facebook! 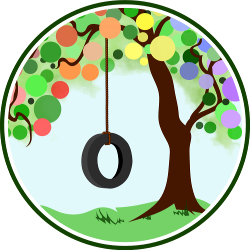 Amy at Peace 4 Parents writes The Value of Parent-to-Parent Support, Truth, Love, and Healing. Also find Amy on Twitter and Facebook. Amanda at Let’s Take the Metro writes The Gathering. Also find Amanda on Facebook. Joni Rae at Tales of Kitchen Witch. Also find Joni Rae on Twitter and Facebook. Mandy at Living Peacefully with Children. Rebekah & Chris at Liberated Family. Also find Rebekah & Chris on Twitter. Lauren at Hobo Mama writes Meeting My NPN Friends. Also find Lauren on Twitter and Facebook! Amy at Anktangle writes Meeting the NPN Family. Also find Amy on Twitter and Facebook. Arpita at Up, Down & Natural writes Me And My Ladies ~ First Annual NPN Team Gathering. Also find Arpita on Twitter and Facebook. Kristin at Intrepid Murmurings writes Seattle Bloggy Meetup & Gluten-free Shortbread! Also find Kristin on Twitter and Facebook! Jennifer at True Confessions of a Real Mommy. Also find Jennifer on Twitter. Shannon at Pineapples & Artichokes writes Thanks. 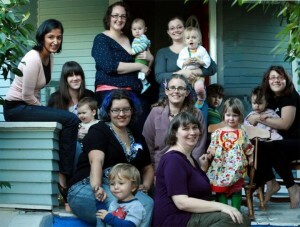 Moorea at MamaLady: Adventures in Lesbian Parenting writes The Natural Parents Are Coming! Hide the Stroller! Melissa at The New Mommy Files writes Building a Modern Day Village. Find Melissa on Twitter and Facebook. Rachael at The Variegated Life. Find Rachel on Twitter and Facebook. Darcel at The Mahogany Way. Find Darcel on Twitter and Facebook. Had a GREAT time! I’m looking forward to an even bigger event next year (with more volunteers)! This has had a really positive impact on us. So glad that we got to be apart of it. I greatly look forward to the next one.